Fourteen times bigger than the White House in Washington, D.C., Los Pinos will be turned into a museum and cultural space. From the moment Andres Manuel Lopez Obrador was sworn in as president of Mexico, the presidential house known as ‘Los Pinos’ was opened to the public as a museum and art gallery as a sign of the new government’s austerity. Hundreds of Mexicans have visited the house since then, taking pictures and selfies in one of the most reserved political places in the country, home to the previous 14 presidents. 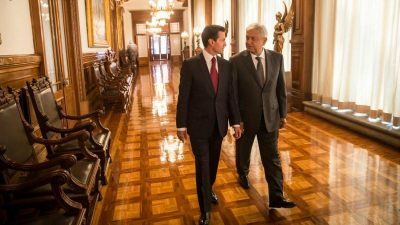 Enrique Peña Nieto left the house a week before leaving the presidency, receiving the King of Spain Felipe VI as his last guest. Built in 1856, Los Pinos wasn’t always the presidential residency. The massive complex of buildings was owned by Dr. Jose Pablo Martinez del Rio, of one of Mexico’s richest families, before being expropriated by the post-Mexican Revolution government of Venustiano Carranza. When President Lazaro Cardenas took office in 1934, he decided to change his residency to Los Pinos, after the Michoacan garden in which he fell in love with his wife, because he wanted the Chapultepec Palace to be opened to the public as a museum. Before Cardenas changed its name to Los Pinos, the residency was known as ‘La Hormiga’ (The Ant), because it was the smallest of Martinez’s properties. As new presidents arrived, they ordered the construction of additional houses within the complex to fit their own taste, lifestyle or political affiliation. Presidents of the Revolutionary Institutional Party (PRI) used to live in the ‘Miguel Aleman’ house, while those from the National Action Party (PAN) chose the ‘Las Cabañas’ construction. As a result, there are now four houses in the complex, besides gardens, squares, halls, pools and other sports facilities, with a constructed space of 56,000 square meters: an area 14 times bigger than the White House. Now, a giant floral arrangement outside reads “People of Mexico, welcome to Los Pinos.” In the presidential office there’s a sign with the names of the three previous presidents and the legend “We received it this way.” Many of the halls, saloons and rooms are empty, but others still house some furniture. The portraits of the presidents are still there, drawing the occasional insult from visitors. Meanwhile, Lopez Obrador went to the National Palace in the center of Mexico City to have lunch with world leaders and other guests, who would be able to taste traditional delicacies such as Huitlacoche, Zapote and many corn derivatives. Outside, at the Zocalo square, thousands of supporters are enjoying the “AMLOFest, inauguration party.